Audrey Niffenegger's dazzling debut is the story of Clare, a beautiful, strong-minded art student, and Henry, an adventuresome librarian, who have known each other since Clare was six and Henry was thirty-six, and were married when Clare was twenty-three and Henry thirty-one. Impossible but true, because Henry is one of the first people diagnosed with Chrono-Displacement Disorder: his genetic clock randomly resets and he finds himself misplaced in time, pulled to moments of emotional gravity from his life, past and future. His disappearances are spontaneous and unpredictable, and lend a spectacular urgency to Clare and Henry's unconventional love story. That their attempt to live normal lives together is threatened by something they can neither prevent nor control makes their story intensely moving and entirely unforgettable. 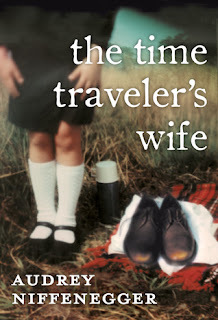 Time stood still for me as I enveloped myself into The Time Traveler's Wife recently. This is not a new title and it was a very popular many years back and there was a movie adaptation as well. I didn't read the book in it's height of popularity and neither did I watch the movie. Such, I have no prior expectations from it other than it's a fairly thick book. I have no idea why there are others who dislike the book and called those who do, having 'poor taste'. Well I like the book. It wasn't the most easy book to read but the story itself was arresting enough for me. It was emotional experience and I guess some people just don't have the imagination for it. I won't analyse the book as to it's cultural connotation, no differential styles between characters and some even analyse to how many times certain phrase appears in the book! Well, that's them and I guess they don't get much enjoyment out of a love story for that's what this book is, not a science fiction, but a love story...a love story that transcends time and goes beyond dimensions. I cry buckets at certain section of the books and yes, at the ending too....*sniff* I love it.